This new Airtel Data Plan offer is a real explanation of "Small Girls With Big God" because with small money, you enjoy big data bonuses when you subscribe to a data plan. (if you know, you know ☺) In other words, new and existing Airtel Customers can enjoy double data bonuses on this package tagged "small money big data plan" . 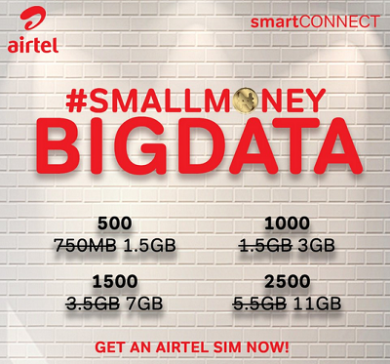 Airtel small money big data plan is available mainly for new prepaid subscribers on SmartConnect. Recall, SmartConnect is a welcome Tariff that gives users bonus upon recharging their lines. The brand new plan gives you both double data and eight times value of your recharge with Airtel smartconnect. ✔️ A recharge of N500 gives you 1.5GB data, instead of the regular 750MB. ✔️ A recharge of N1,000 gives you 3GB data, instead of 1.5GB. ✔️ A recharge of N1,500 gives you 7GB data, instead of 3.5GB. ✔️ A recharge of N2,500 gives you 11GB data, instead of 5.5GB. HOW TO BE ELIGIBLE FOR THIS AIRTEL BIG DATA OFFER? Buy a new airtel sim and by default it’s on smartConnect tariff, then recharge and dial *141# to subscribe your desired data plan and enjoy double data offer. NIB: Tariff on Smartconnect is 50K/sec and 60k/sec to all networks. IS THIS OFFER ALSO AVAILABLE FOR OLD USERS? If you are using an old Airtel SIM, you can try to check if you are eligible by dialing *144# to try your luck. If you get response of subscribing to 1.5GB for N1000, it means you are not eligible but if the options for 3GB for N1000 or 1.5GB for N750 appears, congrats, you can go ahead to activate any plan of your choice by replying with 1,2 or 3 depending on the package you wish to subscribe for. Just dial *140# to check your data balance. Baba, it's working. I just bought new airtel SIM card and it's eligible for double data on smart connect default tarrif plan. More grease to your elbow! is it possible to share airtel data? I just saw an Airtel plan of 3gb for 1k using the code *431#. is this a normal plan or there's something else to it cos I'm tired of airtel's too many restrictions. for example while using social plan, I can only use opera mini, not ucbrowser and in the operamini i can't open sites like yahoo mail, jumia, twitter, instagram, jiji and many others.